Why Easter? - What’s so important about Easter? Why is there so much interest in a person born 2,000 years ago? Why are so many people excited about Jesus? Why do we need him? Why did he come? Why did he die? Why should anyone bother to find out? 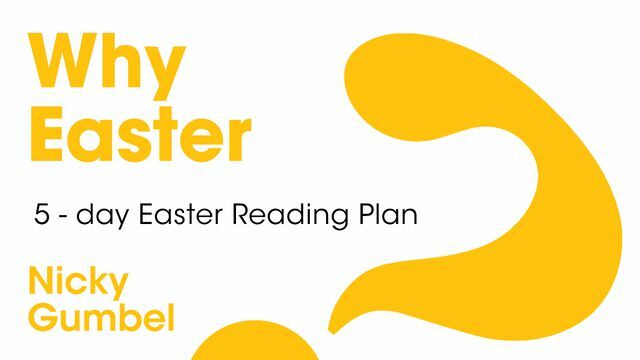 In this 5-day plan, Nicky Gumbel shares compelling answers to those very questions. Others try drugs or excess alcohol or sexual promiscuity. One girl said to me, ‘These things provide instant gratification but they leave you feeling hollow afterwards.’ Still others try hard work, music, sport or seek success. There may not be anything wrong with these in themselves, but they do not satisfy that hunger deep inside every human being. Even the closest human relationships, wonderful though they are, do not in themselves satisfy this ‘emptiness deep inside.’ Nothing will fill this gap except the relationship with God for which we were made. According to the New Testament, the reason for this emptiness is that men and woman have turned their backs on God. Jesus said, ‘I am the bread of life’ (John 6:35). He is the only one who can satisfy our deepest hunger because he is the one who makes it possible for our relationship with God to be restored. Only in a relationship with our Creator do we find the true meaning and purpose of our lives. Most people do not want to die. We long to survive beyond death. Only in Jesus Christ do we find eternal life. If we are honest, we would have to admit that we all do things that we know are wrong. By his death on the cross, Jesus made it possible for us to be forgiven and brought back into a relationship with God.